You are at:Home»April»April 21»April 21, 1934: Famous “Surgeon’s Photograph” of Loch Ness Monster Taken! April 21, 1934: Famous “Surgeon’s Photograph” of Loch Ness Monster Taken! On April 21, 1934, one of the most famous photographs in history was taken by a London gynecologist! Loch Ness, one of a number of lakes in the Scottish Highlands, is said to be inhabited by a monster(s). The earliest reference to such a creature in Loch Ness goes back to 6th century, when a man was allegedly attacked by an unknown beast. The modern history begins in 1933 when the term “Loch Ness Monster” was first used in a newspaper article which was followed by numerous “sightings” and the first report of the monster on land by a Mr. Spicer and his wife. Although not the first photograph of “Nessie” as the monster is affectionately called, the “Surgeon’s Photograph” is relatively clear compared to the first photo taken by Hugh Gray. The photo appears to show the long neck and small head of a creature swimming along with its body hidden just under the water. Critics have said the photo is of an elephant moving under water with its trunk extended out of the water. Other opined that the photo was of a waterbird such as a goose or loon. 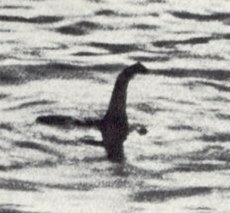 In 1975, the actual photographer, Christian Spurling, revealed that his photo was a hoax, and later described the entire process in book, Nessie- The Surgeon’s Photograph Exposed (1999). Spurling admitted that the hoax photograph was of a small submarine (bought at Woolworth’s) with the head and neck constructed of plastic wood. Of course, other researchers and documentary makers have a vested interest in the continued belief in Nessie and dispute Spurling’s confession. So much “research” has been done by investigators keeping the Loch under 24 hour camera surveillance, extensive sonar mapping of the depths and attempts at underwater photography, not to mention the tourist dollars that having the public convinced the whole thing is a hoax would cost these people plenty of money. Is Nessie real? Is she a prehistoric dinosaur relative, perhaps a plesiosaur? Is she really a giant eel, one or more seals, an unknown aquatic mammal, a diving bird, or what? Tell us what you think, hoax or real, and if real, then what? Campbell, Steuart. The Loch Ness Monster: The Evidence. Prometheus Books, 1997. Schach, David. The Loch Ness Monster (Torque Books: The Unexplained) (Torque: The Unexplained). Bellwether Media, 2010. Previous ArticleApril 20, 1918: Bloody Red Baron Shoots Down 79th and 80th Airplanes!